Postal Reform Finally Becomes Law. After years of effort by the Post Office and Direct Mailers, President Bush signed into law the first major changes in decades on how the post office will work. The new postal reform legislation will prohibit rates from rising beyond the pace of inflation and frees up billions of dollars used to finance the pensions and health-care costs of postal retirees. Unlike other government agencies, the U.S. Postal Service has been forced to pay retirement benefits earned by its workers during time spent in military service. This mandate required the USPS to place $3 billion annually into an escrow account to fund the benefit. The new law requires the agency to use that money to fund retiree medical benefits for 10 years. After that, the money may be available for other uses. This requirement was the reason postal rates increased 12 months ago. While the post office will continue to need to raise postage rates due to inflation and increased energy costs, the money freed-up will help the post office lessen the need for postage increases. In fact the new legislation will allow the USPS and the mailing community to plan for smaller, more affordable rate increases. Innovative Ways to Clean and Improve Your Mailing List. Think you know all the available services to clean your mailing list? Here are some services that you may not be aware of. NCOA is a process that can clean your mailing list, reduce postage and cut down on wasted materials. When individuals and companies move they fill out a change of address form at their local post office. The NCOA program identifies records on your database that match with the NCOA database. When a match is found the NCOA will update your file with the new address. The database contains approximately 152 million records and 48 months of permanent address changes. Temporary moves are not recorded on NCOA. AEC processing may transform problem addresses into accurate, standardized addresses, which allows mailers to take full advantage of automation discounts. AEC focuses on correcting address element deficiencies such as misspellings, nonstandard abbreviations, incorrectly joined elements, improperly ordered elements, address lines containing data other than the actual address, and missing elements. After resolving address element issues, AEC matches the address against the ZIP + 4 Product using CASS-Certified address-matching software, resulting in a correct, standardized address. DSF is a database that the United States Post Office has compiled and maintains. The file contains approximately 140 million records - each and every address in the United States. The file consists of residential addresses, apartments, businesses and PO boxes. 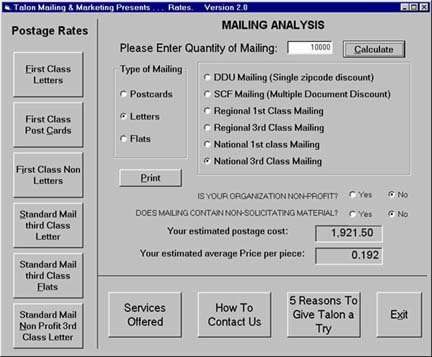 Talon can help you compare your mailing list to the DSF file. If an address on your list does not exist on the DSF file then the record gets flagged and you have an undeliverable address. To improve the DSF success rate Talon will perform address correction and standardization before doing a DSF. The pre-DSF process will fix addresses that have bad information such as an incorrect zipcode, street or city misspelling. 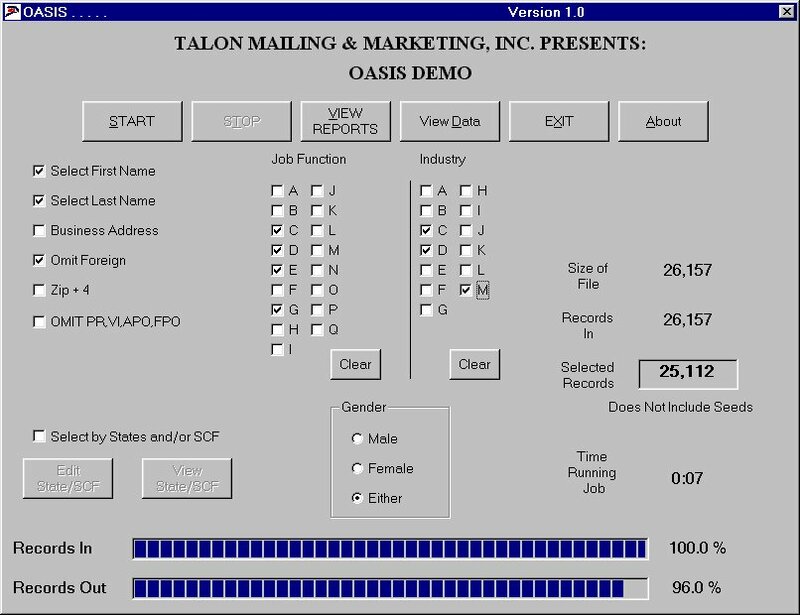 By performing pre-DSF clean up, Talon can fix records and make some undeliverable addresses deliverable. 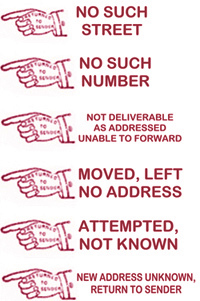 Once completed the DSF will be performed to eliminate addresses that are undeliverable. Lacs was developed to help local 911 systems convert business and residential rural route addresses to street-style addresses. Because the residents do not actually move when they receive a new address, NCOA will not correct these changes of addresses. If you fail to update the addresses on your mailing list, beware that you could lose contact with your customers since after one year, the post office considers the changed rural route addresses as undeliverable mail. Talon can flag the records of individuals on your mailing list who are deceased. Deceased data is based on Social Security Administration records and other sources and is updated quarterly. Generally we find the match percentage will vary depending on the accuracy and age of the data on your list with an average range of 1-3%. Talon can flag records of companies that have gone out of business. Out of Business Coding typically matches an average of 1 - 2% of a file. This process only applies to business addresses and is updated monthly. After performing the services above you may find you have duplicate records on your file (an old address gets "fixed" and matches a newer, existing record). Talon can eliminate duplicates, even finding difficult and tricky matches. Tuesday January 30th, 2007. Islanders vs. The Detroit Red Wings 7:30 PM. Innovative Ways to Clean & Improve Your Mailing List. copytalk - Email retrieval & reply service that makes it easy to keep up with your email from anywhere. bplans.com - providing solutions to help build and grow a business. Tons of practical business advice and tips. crayon.net - Great site, make your own online newspaper, then receive it daily. overheardinnewyork.com - site devoted to the funny and weird statements heard by people in New York.